Background: why is an mhGAP costing tool required? Providing mental health services involves putting together human, physical capital and other resource inputs in order to deliver interventions and services capable of improving mental health and related outcomes. A basic initial requirement of any mental health system is therefore to assess what resources are needed to deliver services to the population in need and meet programme goals. The first step in such an exercise is to ascertain what resources are available now (mental health professionals, inpatient beds, day care places, etc. ), followed by an appraisal of expected service needs and costs at target levels of service coverage (see Figure 1). The lack of complete or reliable local epidemiological and resource data has thwarted such efforts in many countries, but that is now changing with the generation of national mental health profiles (see, for example, WHO’s mental health ATLAS database. The main drawback of this earlier analysis was that it was restricted to a limited number of interventions and countries, meaning that no complete estimate was available for ascertaining the expected costs of scaling up a broader set of effective population-based and individual health-care interventions for mental, neurological and substance use disorders. This information gap is a serious impediment to more comprehensive resource mobilization and financial planning at global and national levels. In response to this information gap, WHO has developed a financial planning tool for scaled-up delivery of a whole set of evidence-based intervention strategies for mental, neurological and substance abuse disorders (based on the mhGAP Intervention Guide. Objectives: what does the mhGAP costing tool provide? The mhGAP costing tool has been developed as a financial planning tool for scaled-up delivery of a set of interventions for mental, neurological and substance abuse [MNS] disorders. 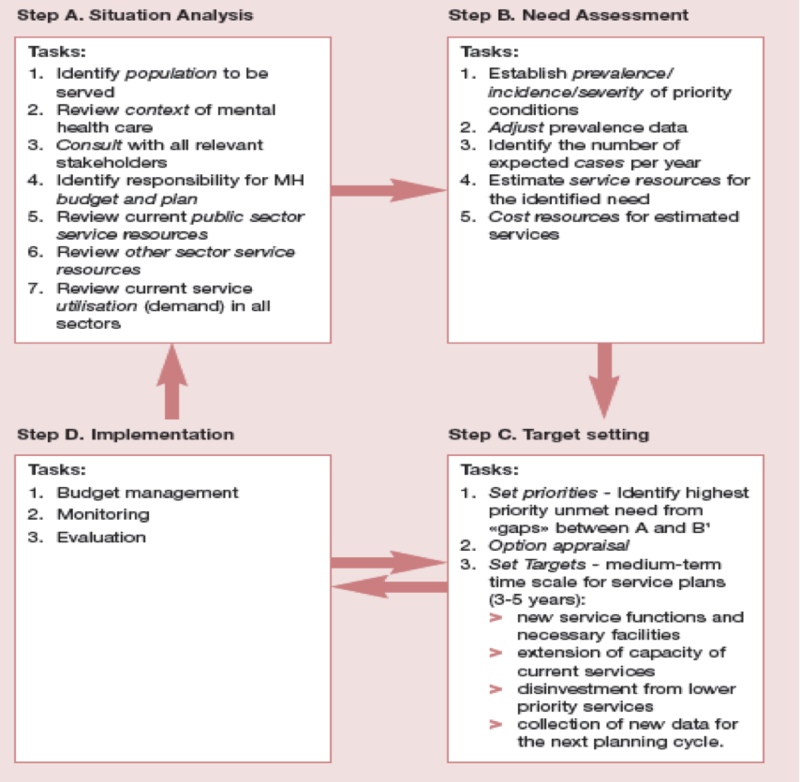 It is a strategic tool for medium-term planning (over the period 2011-2025) that can be used to generate forecasts of human and financial resource needs at the national or sub-national level. It is useful for enhancing traditional budgeting mechanisms in countries and for providing new information to development agencies concerning appropriate resourcing levels needed to tackle the growing burden of MNS disorders. The tool produces estimates of total and incremental costs of scaled-up provision, broken down by different categories (e.g. by different mhGAP disorders, by types of expenditure, by year of scale-up, and by currency type [local or US$]). The costing tool was applied in the study titled "Estimating the cost of implementing district mental healthcare plans in five low- and middle-income countries: the PRIME study" by Dan Chisolm, et al. (2015). Click to request access to and assistance with the mhGAP costing tool.